Winning rider of Red Bull Hardline Ruaridh Cunningham paid tribute to Gee Atherton: "Gee was a man amongst boys this week. If he hadn't coaxed us through the jumps, I don't think we'd have made half of the course." 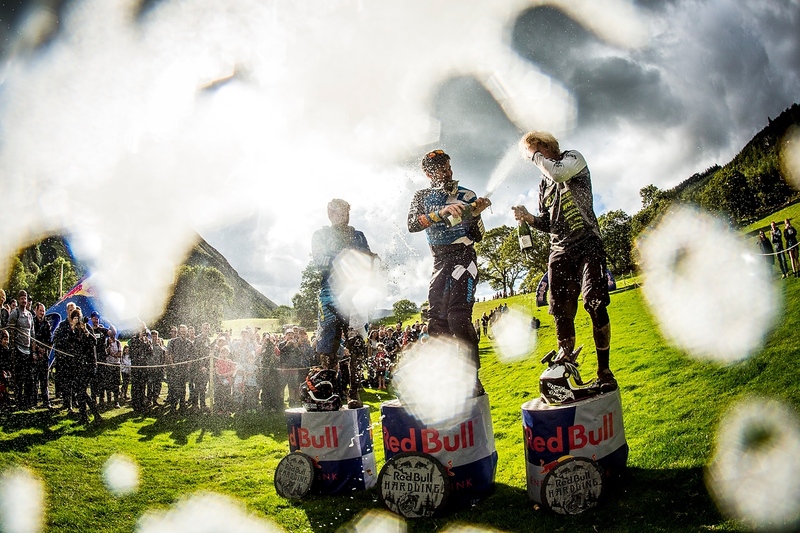 The second Red Bull Hardline was bigger, gnarlier and muddier than last year's test event. Once again the riders discovered a great camaraderie as they sectioned the track. 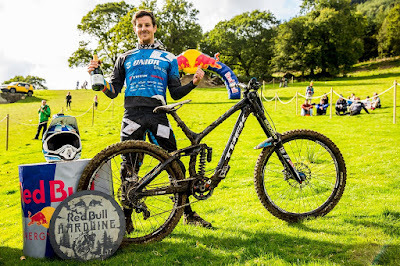 Everyone was missing the course creator and inspiration, Dan Atherton, who was out injured in a crash during testing but Gee took the lead to master the track and raise confidence for all the riders. Even Dan's absence and a wet and windy morning couldn't dampen the excitement as they took to the course for their Saturday qualifying session. Qualifying was open with riders free to put in up to three runs and take their best times. The course was tacky with riders and bikes picking up a lot of mud. High winds up top meant that the riders started their runs from Dirty Ferns, just over halfway down the course. 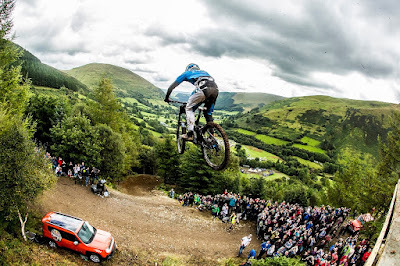 Gareth Brewin, a co-creator of the course, Taylor Vernon and Canadian Mark Wallace all took knocks in the practice that ruled them out of any further racing. Gee took the lead in run 1 with a time of 1.33.490, shaving hundredths of seconds off on run 2 to take the qualifying lead with 1.33.242. Veteran of last year's event Joe Smith took the second and Hardline newcomer Bernard Kerr took the third. Sunday morning practice was dry, though Dan and Olly's dig crew were kept busy on last-minute repairs, clearing mud debris and smoothing out ruts that had formed on the approach to the jumps. Gee was first to send the Dirty Ferns jump and he led the pack down the mountain, all in one piece. Ruaridh Cunningham and Reese Wilson chose to put om a second practice run while the rest of the riders chilled and tried to converse their physical and mental energy for the Finals run. 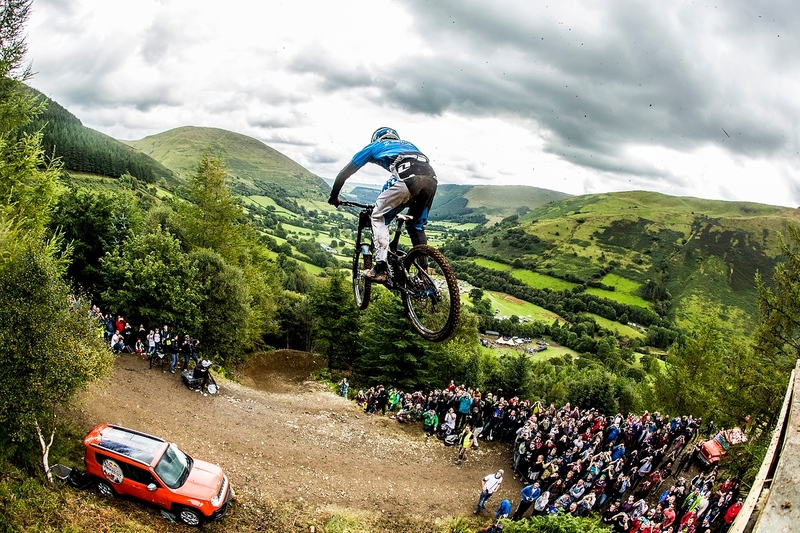 Lluis Lacondeguy and Kye Forte decided not to race after a series of crashes in practice. Kye had been suffering a concussion and Lluis said he felt sketchy and just wasn't enjoying riding in the wet. As Gee left for his Finals run, Ruaridh popped his head into the GT Factory Racing pits to report that ground in the open was drying out to a pretty good condition. The vibe in the maximum capacity crowd switched up to full-scale nervous anticipation and the race was ON. First down was Al Bond, riding Dan Atherton's bike! Al was 1.05.43 at split 1 but he cased the big hip, went down, got up but punctured above the road gap and finished the run on his rim. Adam Brayton was slower than Bond at split 1, but he made time to go two seconds faster by split 2 and crossed the line in 4.11.0 to go into the hot seat! Adam said: "The crowds are awesome up there!" Craig Evans, Adam's Hope Factory Racing team-mate was down about five seconds at split 1, 18 seconds back by split 3 but still looked as if he was having fun, finishing his run with a huge whip. Reece Wilson is only in his third season of racing Downhill. He looked fast at split 1 but went down on the hip, to be down 11.7 seconds at split 3. He hit the cannon jump for the first time in his Finals run, styling it up over the Final fly off to cross into second. Reece said: "I was actually enjoying it - a shame to crash but I'll be back again I'm sure." Ruaridh Cunningham started his run fast, going five seconds up at split 1 and an unbelievable 17.8 seconds up at split 2. He was 28 km/h through the speed trap (actually the slowest rider) but he still went more than 30 seconds up at split 3, crossing the line 17.2 seconds ahead of Adam Brayton to take the hot seat. Third-fastest qualifier Bernard Kerr was six seconds down by split 2, crossing into second place, seven seconds back from Ruaridh. Second-place qualifier Joe Smith had the race's fastest speed through the trap (34 km/h) but he was two seconds back at split 2, 5.7 back at split 3 making up three seconds at the bottom of the course to go into second place with 3.57.402. Then fastest qualifier Gee was on course. Last year Gee had qualified first but punctured on his Finals run so the GT Factory Racing team was holding its breath, knowing how important this run would be to him and how disappointed he had been not to show what he could do on this course. Alarm bells were raised when Gee was 5.9 seconds back at split 1. He had been so in control all week that it seemed an unlikely time without a mechanical. It soon became clear that history had repeated itself - Gee had punctured. His tyre came off the rim and he had to limp down to a hero's welcome. Ruaridh said: "That was my first full run all week - my heart rate is about 240! Gee was so unlucky, I'm gutted for him. Without Gee showing us all the way this week, we wouldn't have done it. He was a man amongst boys - thanks man."